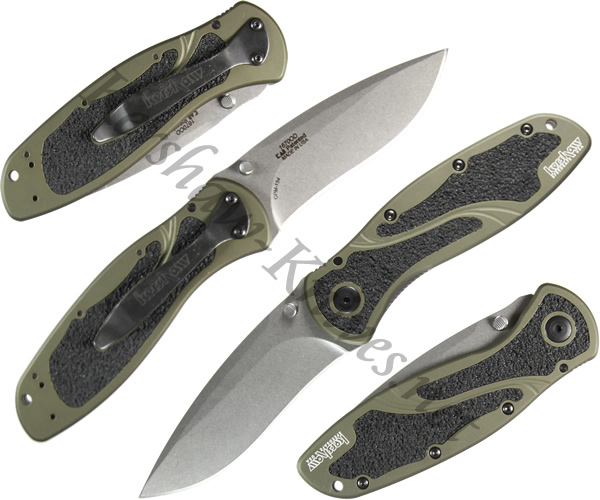 This Kershaw Blur stonewashed model 1670OD is proudly made in the USA. The fine edge blade is from stonewashed CPM-154 stainless steel. The visually appealing handle is 6061-T6 anodized olive drab aluminum with contrasting Trac-Tec inserts. These inserts make the Blur 1670OD a pleasure to handle in all weather conditions. Dual thumb studs provide ambidextrous operation that is a breeze with the Kershaw Speed Safe assisted opening system. Once open, the blade is locked into position utilizing a liner lock. A lanyard hole is integrated into the end of the handle, and a carrying clip is included.